Do you have a compensation and leveling strategy? Scaling companies that prioritize a formal compensation system are finding value in the clarity and fairness that these foundational structures create. A strong and standardized compensation and leveling plan is critical to both serving the business’ need for financial efficiency and keeping employees happy. 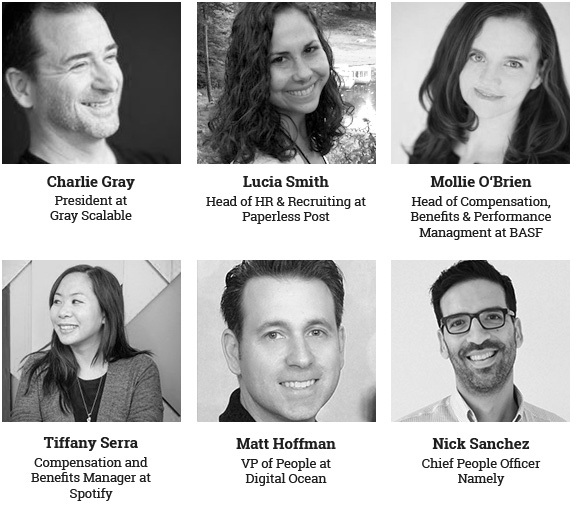 Our panelists for this event, held on October 18th at Work-Bench, included Lucia Smith, Head of HR & Recruiting at Paperless Post, Matt Hoffman, VP of People at DigitalOcean, Tiffany Serra, Compensation and Benefits Manager at Spotify, Mollie O’Brien, Head of Compensation, Benefits & Performance Management at BASF, and Nick Sanchez, Chief People Officer at Namely. Panel will be moderated by Charlie Gray, President at Gray Scalable. Thanks to all who attended!